Welcome to the Casa Verardo Hotel Venice, a superb 3 star hotel located deep in the heart of historic Venice just 100 metres from one of the most famous squares in the world, Piazza San Marco. Casa Verardo Venezia, occupying a 16th century ancient noble palace, offers a perfect fusion of historic surroundings and modern technology making it the perfect base to explore Italy’s most romantic city. Casa Verardo Venezia offers just 25 air-conditioned guestrooms ensuring privacy and a more personalised service from our friendly and multilingual staff. At our stylish and welcoming hotel we offer impeccable service catering to all types of guests from honeymooners to families, singles and business clients. By clicking on our Casa Verardo Venice Interactive Virtual Tour you will be able to explore for yourself all the public and private areas of our officially recognised Residenza d’Epoca hotel including our traditional Venetian guestrooms in various sizes with marble en-suites, bar, garden and our panoramic terraces offering beautiful views of Venice. 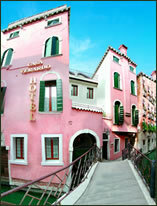 Phenomenal sights await you within metres of Casa Verardo Venice. St .Mark’s square, Palazzo Ducale, The Rialto Bridge and Galleria dell’Accademia are all within walking distance. Check our Location page for more information about where we are precisely including our Interactive Map of Venice. At Venezia Casa Verardo we may be small but we offer an outstanding quality of service and a vast range of facilities ensuring that you will want for nothing during your stay. Our 25 air conditioned rooms are all elegantly individually decorated and come with all the modern comforts one could possibly need. Click on our Rooms and Services page for more details. Check out our very competitive rates and what special offers are available via our Reservations page and to help plan your holiday in the spectacular city of Venice and indeed the rest of Italy, go to our specially created Links page.